Short CV: Dr. Nathanail Kortsalioudakis was born in Chania, Crete, in 1973. He holds a bachelor degree in Physics obtained by the University of Crete, a Master of Science (M.Sc.) degree in Applied Physics and Technology of Lasers by the Department of Sciences-Physics Division of the Technical University of Crete (TUC) and a Doctorate of Philosophy (Ph.D.) by the same department. His doctoral thesis is entitled: "Interaction of laser radiation with matter, with emphasis on examining the physical mechanisms occurring during the propagation time of short high-intensity laser pulses in gases and solids”. During his studies he received scholarships: by the Foundation for Research and Technology (FO.R.TH.) for the preparation on his undergraduate thesis, by National Foundation of Scholarships of Greece (I.K.Y.) for best postgraduate student performance of his department. From 2002 to 2014 he was a member of the educational / research laboratory of Matter Structure and Laser Physics of TUC with main tasks on teaching Laboratory Physics (Mechanics, Thermodynamics, Electromagnetism, Optics) and research on basic and applied research in laser physics participating in various national and European research projects. As a researcher, he is co-authored original research papers published in international peer-reviewed journals and he has also participated at national and international conferences as an invited speaker. Also from 2003 to 2011 worked as a Teaching Assistant in the TEI of Crete, Branch of Chania, where he taught the courses: Physics Laboratory at the Department of Electronics and at the Department of Natural Resources, Applied Electromagnetics Laboratory at the Department of Electronics, Metrology Laboratory at the Department of Natural Resources and also taught the course "Laser Technology" at the Department of Electronics. 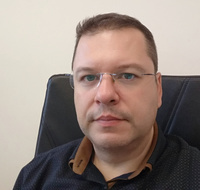 Since May 2014, he has appointed as Laboratory Teaching Staff (EDIP) at the School of Electronics and Computer Engineering (ECE) of the Technical University of Crete. His research interests cover the thematic areas of Laser Physics, Photonics and Optoelectronics.